With townhomes and garden-style flats available, your next one, two, or three bedroom apartment awaits you at Sedona Square Apartments. One bedroom apartments and townhomes supply you with ample living space in a gated community. A variety of two bedroom apartments provide you with options to meet your personal tastes and living requirements. Three bedroom apartments make living with a family or roommates a breeze with plenty of room for everyone to spread out. 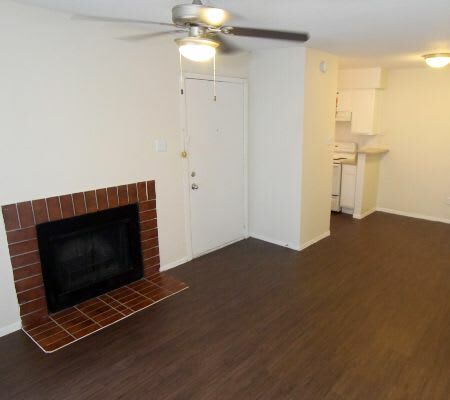 At Sedona Square Apartments, we provide you with a variety of floor plan options in order to appeal to your personal wants and needs. Not only can you spread out with ease at Sedona Square Apartments, but we’ve curated our apartments to feature incredible interiors you’ll be pleased to come home to each day. Living in Houston, air conditioning is essential, especially in the summer months. All of our apartments include air conditioning, as well as ceiling fans for increased air circulation. Fireplaces create a warm atmosphere and welcoming ambiance. Perhaps our most sought-after feature, hardwood-style flooring provides a touch of elegance in it’s easy-to-maintain surface. Walk-in closets provide the space you crave in your bedroom. Browse our selection of one, two, and three bedroom apartments and one bedroom townhomes in Southwest Houston, TX. After you’ve found your favorite, contact us to schedule your personal tour and for more information about current availability.